Since the announcement of the cancellation of The Clone Wars, Disney and LucasFilm have been silent on the subject. Our website was established on March 14th. Since then, our Facebook page has reached over 2,600 likes, and our Twitter account has reached over 600 followers. 11ThirtyEight.com sent out 249 letters on behalf of the fans. On Facebook, we have had hundreds of people say that they have sent real letters into Disney and LucasFilm. Last week, the good people over at 11ThirtyEight.com sent in 249 letters on behalf of fans who were could not afford send in letters or were over seas. Their second deadline passed yesterday, and they are about to send in the second round of letters submitted to them. On Twitter, thousands and thousands of tweets have included the hashtag #SaveTheCloneWars. We reported about the first Twitter protest previously, and the protest has never really stopped with people continuing to reach out to Disney daily using the hashtag. We have also received support in our campaign from several Star Wars veterans. In other forms of social media, Clone Wars fans have posted YouTube videos in support of the series. One of the most effective to date, is the video listed below of a little girl calling LucasFilm trying to Save The Clone Wars. We are continuing our campaign, and we are awaiting more news from Disney. If you haven't already reached out to Disney, please do so if you are passionate about The Clone Wars. 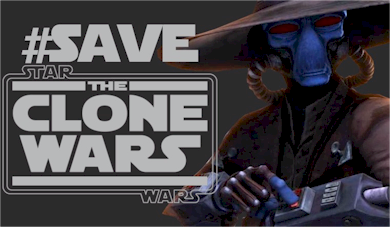 @Disney and use the hashtag #SaveTheCloneWars! View More Ways to Reach Out. Let's Save The Clone Wars.